Solar power: works great when the sun is out. It works less great when the sun isn’t out, which happens every night, as you may have noticed. To fulfill any dreams of living in a world powered by the sun, there needs to be some sort of solution for storing energy gathered during the day for nighttime. And that solution might be molten salt. 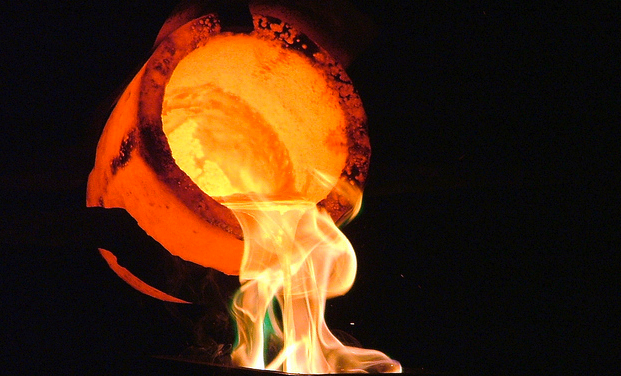 Molten salt, for those scratching their heads, is simply a good conductor of heat. A new power plant will use nearly 20,000 heliostats–basically very focused mirrors–aimed at a focal point in a tower, which will heat up salt to a steamy 1,050 degrees Fahrenheit. 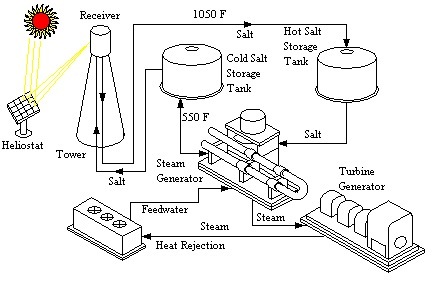 Pump that salt near some water and you get enough steam to run a turbine. Hold that salt at that high temperature and then put it near water later and you get power when the sun isn’t out. The Department of Energy just poured $737 million of loan guarantees into the Crescent Dunes Solar Energy Project in Nevada. It’s being run by rocket scientists from Pratt and Whitney, who are no doubt putting their expertise with high temperatures to work in the plant. dotting the horizon. Along with the wind turbines. A clean power future means there will be many tall things on the horizon.